Our students are our greatest asset - both in your presence here and in your encouraging words to others. We would like to give back to you for sharing your TLC experience with others who wish to start a new journey in their lives.The TLC Referral Program is open to the more than just our current students. We know our alumni, clinic clients, instructors, massage therapists, family and friends all know someone who would make a great Massage Therapist. 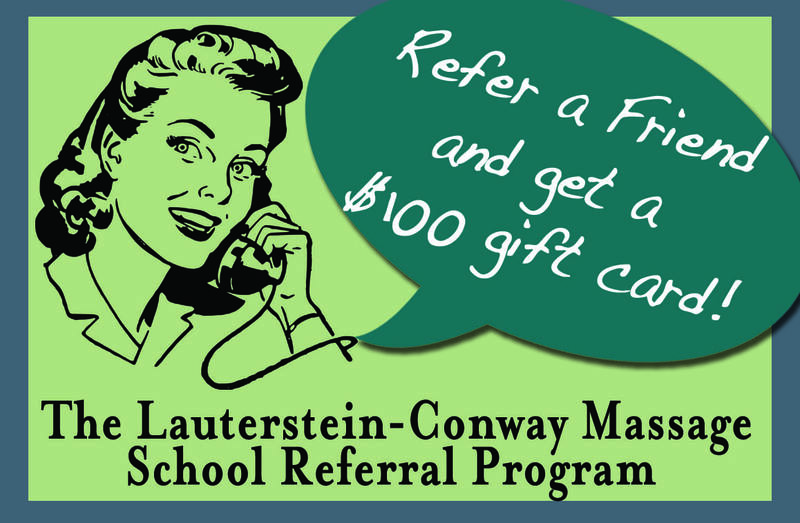 Refer someone who starts school and you will receive a $100 Gift Certificate to use in the school store, clinic, or as workshop credit! To submit a Referral please fill out the form below or contact Admissions Director, Alex Sellers, directly at 512-374-9222 ext: 14 or email alexs@tlcschool.com.